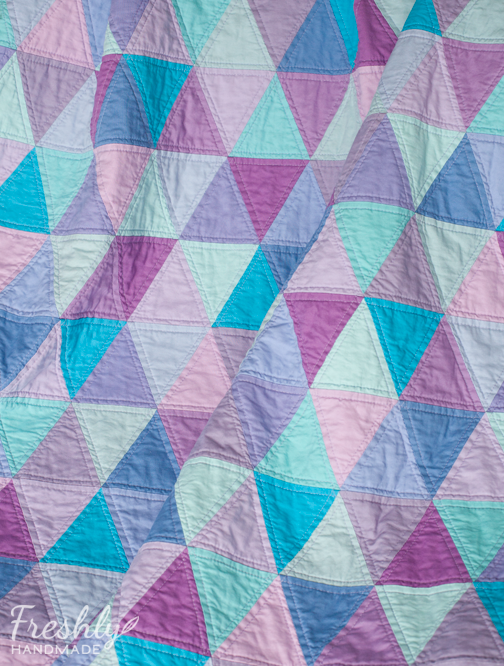 The purple and turquoise triangle quilt for my daughter is finished and thankfully she loves it. She doesn't always have the best track record when it comes to consistently liking things. What can I say, she's five. The one thing that I can count on is her love for purple (and blue) so I had a good feeling I was going to deliver on this one. 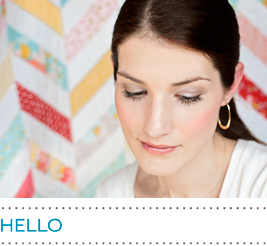 You can read my prior posts on this quilt and her color obsession here and here. For today, I'm just going to share with you the finished quilt in pictures. 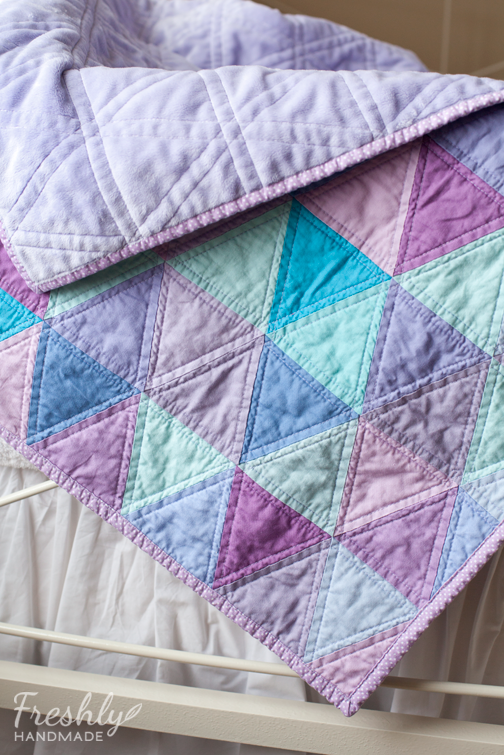 And, because I found that triangle quilts can be tricky, and because some of you were curious on how I made this one, and because you all are just so awesome, I have a free pattern and tutorial available for you to download at the end of this post. 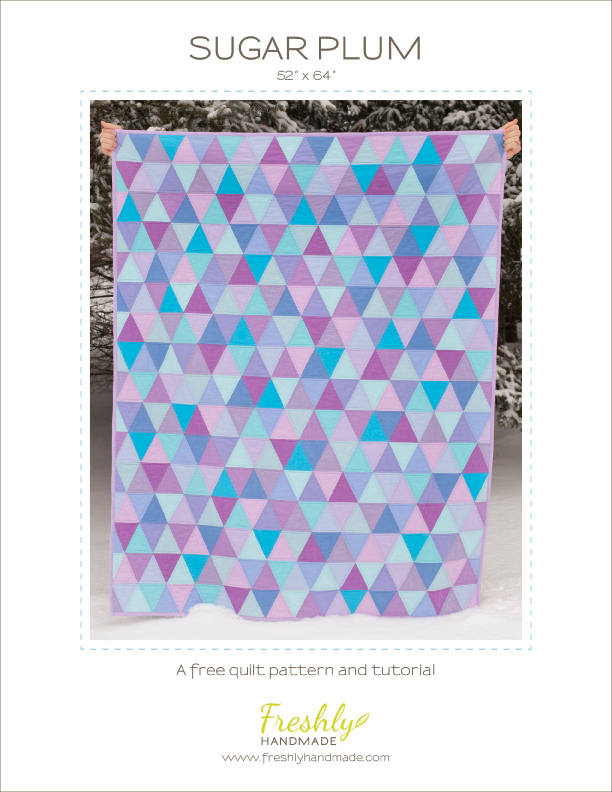 I sincerely appreciate all the nice comments and encouraging words that I've received and I hope you all get to make this quilt or one similar with success! Ok, now let's look at the finished product and my darling babe, shall we? 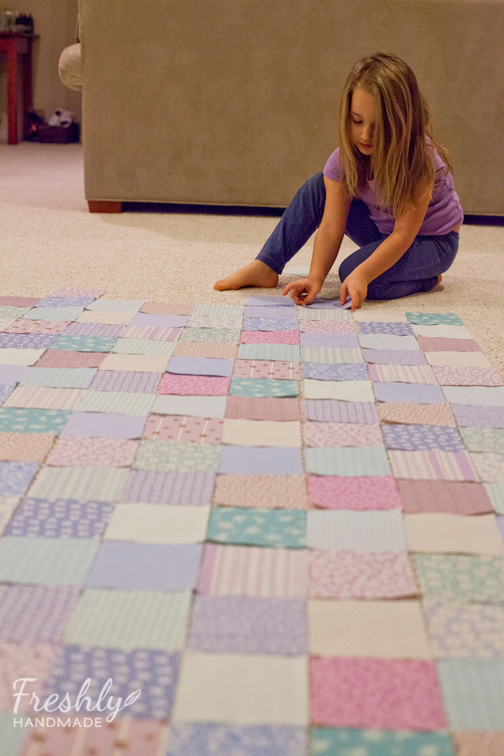 The quilt measures 52" x 64" which is plenty big for her now and something she can use for many years to come. 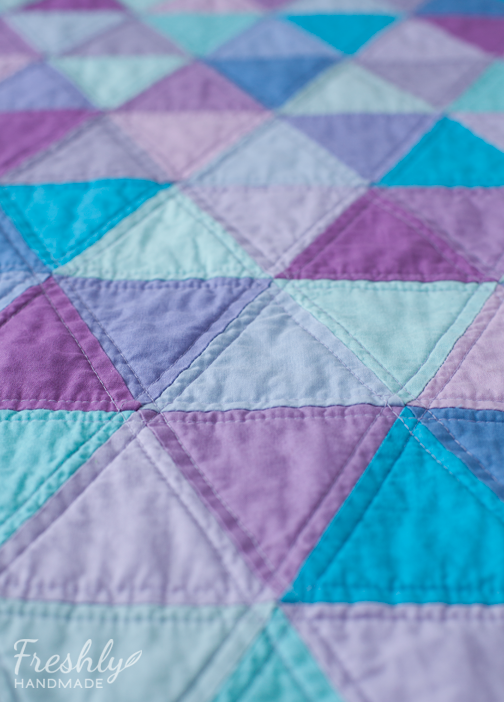 I quilted it with straight stitching along the diagonal and horizontal seams in light purple thread. For the back, I used super soft light purple minky. I think that is my daughter's favorite part. 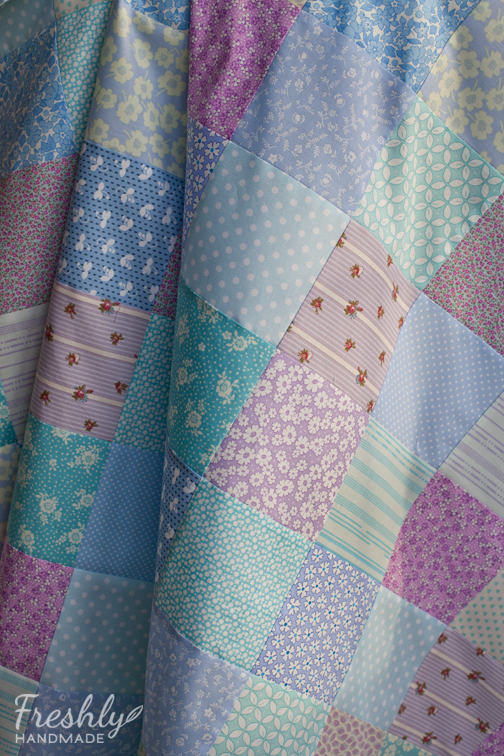 I decided to add a bit of pattern with the binding which is Mini Confetti Dot by Dear Stella Designs. You can see that it has already been washed and dried and has a lovely antique-like crinkle. 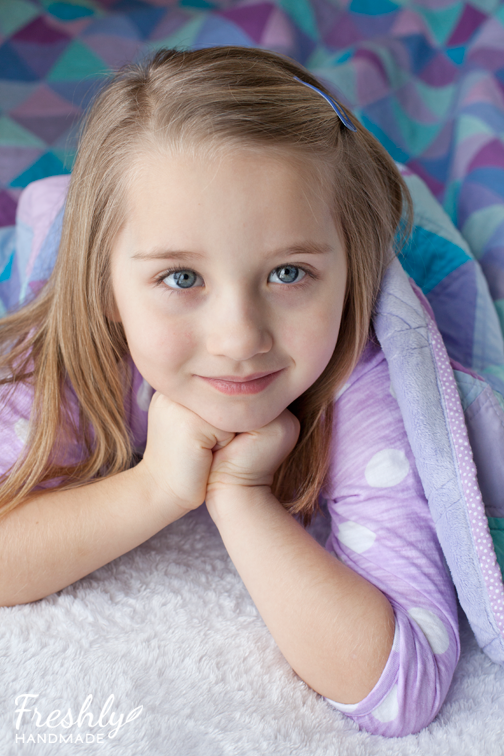 Here is my sweetie with her new quilt. 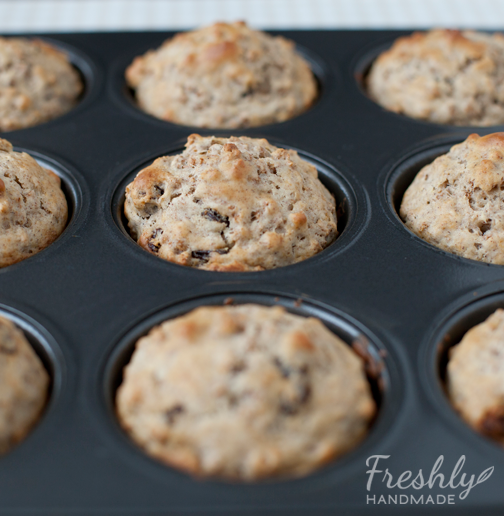 I got a few shots in before nap time. And I had to sneak in and take a couple of her sleeping with it too. 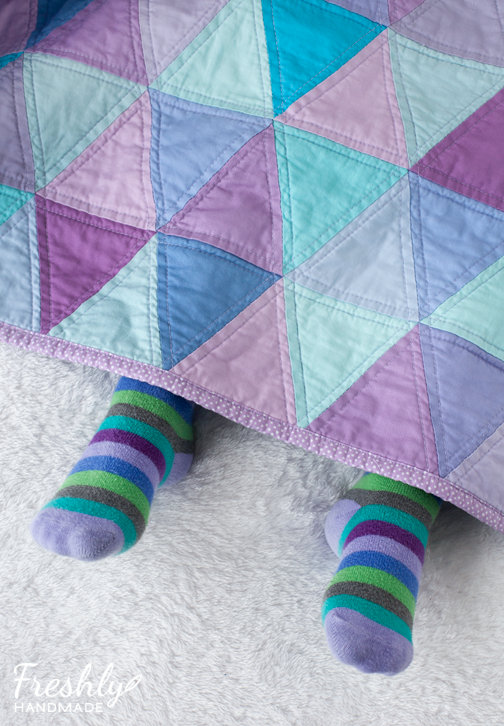 I'm telling you, with the amount of purple this girl has she will coordinate with her quilt on a daily basis. 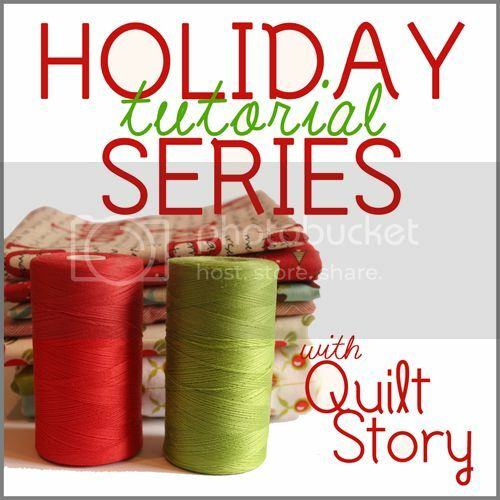 A couple notes on the quilt pattern and tutorial. I wrote it for a beginner, even though I don't know if this is really a beginner quilt. The methods I used are just what worked for me with the tools that I used. 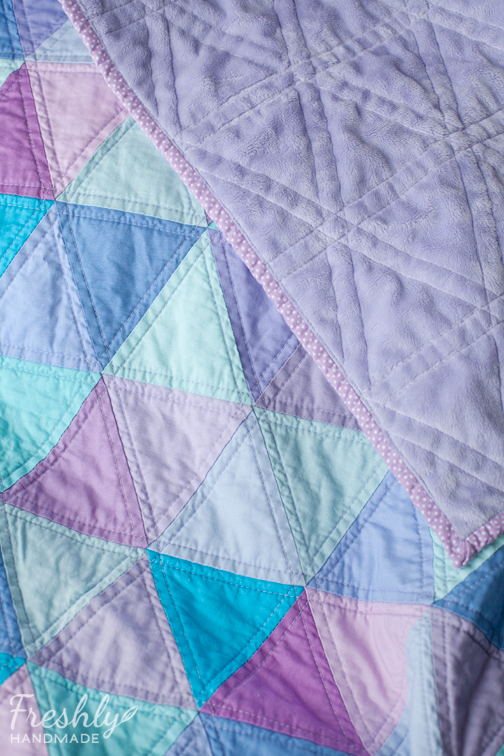 If you've had problems in the past with a triangle quilt or if this is your first time, you may have to make some adjustments depending on your equipment and materials. I encourage you to make a couple small samples before cutting all of your fabric (like I did) in case you aren't a fan of the results. Click the image below to access the PDF pattern. 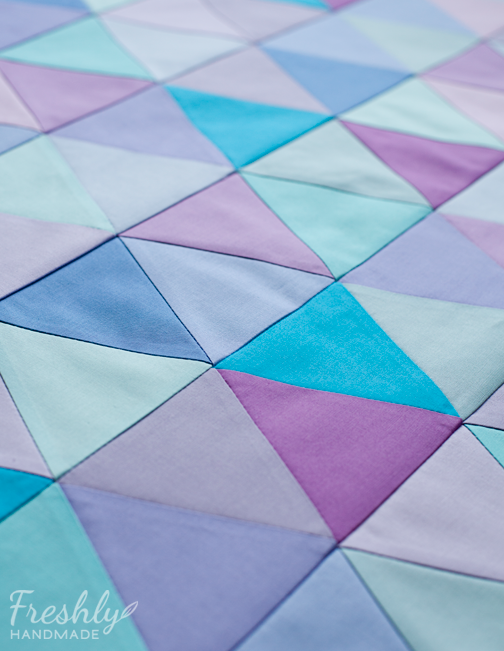 This triangle quilt has been slow-going, but I thought I'd share with you my progress. As much as I loved the gradient of colors that I showed in my first post here, I decided to go with a random pattern of colors. I'm not going to lie, triangles are tricky and it took me a few tries and quite a bit of seam ripping before I got the hang of it. I'll share more on my discoveries in my final post. I told you my daughter loved purple and over the last few days, I'm really noticing how much purple she has. This doesn't even scratch the surface, but I thought it would give you an idea. This is just from one day. And of course, her purple heart blanket. This one can't get enough. I never was a purple lover, but it's growing on me because of her. 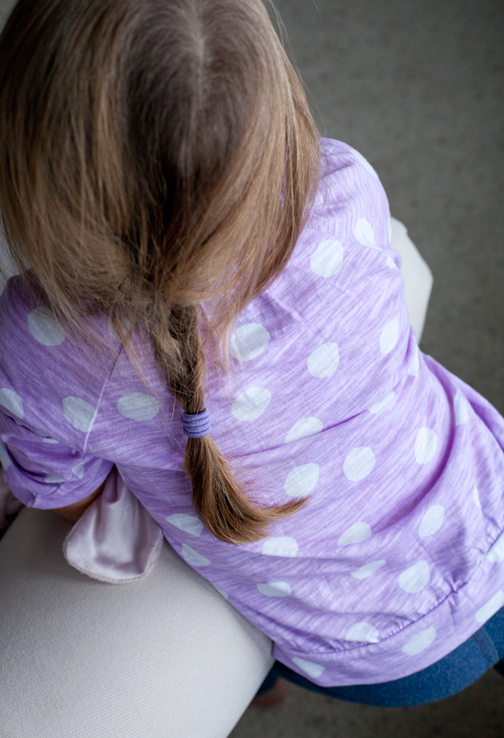 Do you have a child obsessed with a certain color? 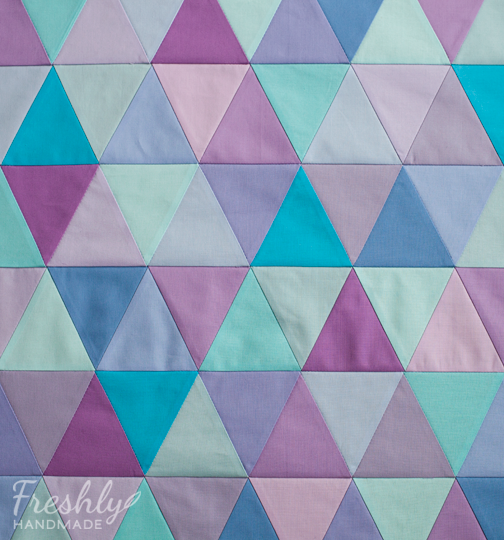 And on a quilting note, have you tried a triangle quilt like this? If so, what was your experience? I'll share more on mine soon. 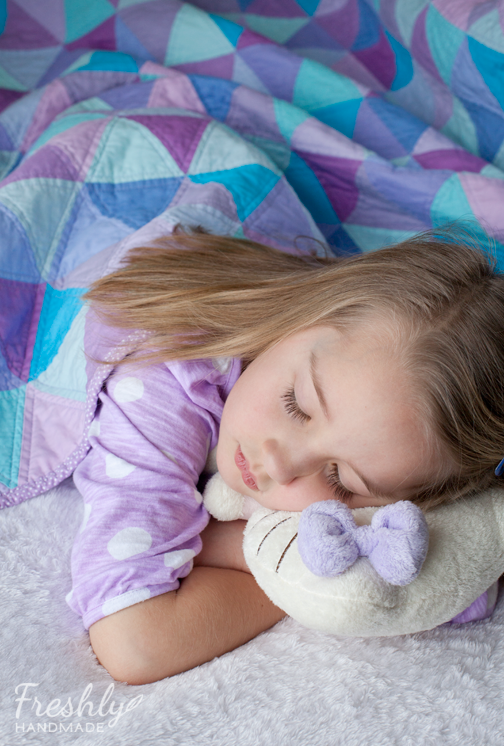 Christmas is sort of long gone, but I promised both of my kids a quilt for the holiday. Needless to say, time got away from me and they didn't have finished quilts when Santa came. They understood that mom was busy and that I wouldn't forget about them, so they were fine waiting. 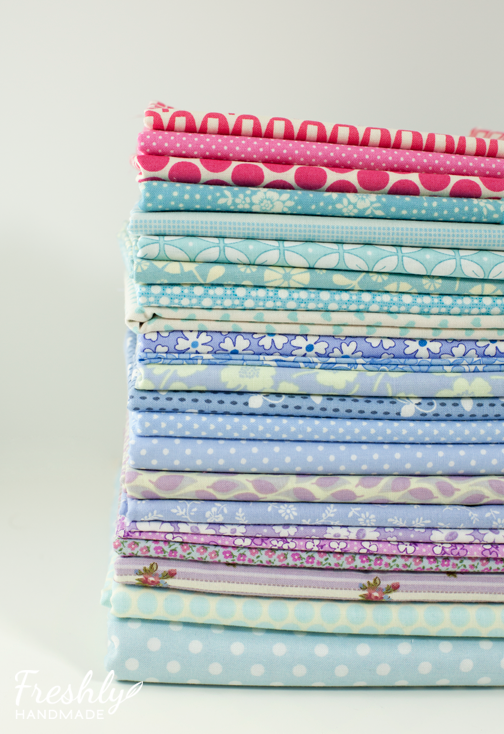 Now that I have the elephant patchwork quilt finished I'm able to tackle their quilts. And because my son is such a sweetheart, he told me to make his sister's quilt first. 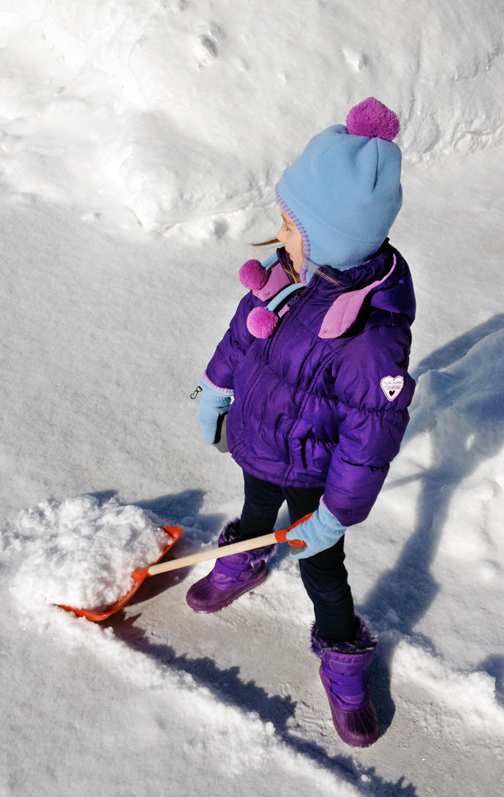 My five year old daughter, lovingly nicknamed "Babe", loves herself some purple -- everything purple. She also loves turquoise blue. Not a pretty, soft or muted shade of each like her mother would like, but bright -- the brighter the better. I sort of cringe at the combination. So here's the deal. 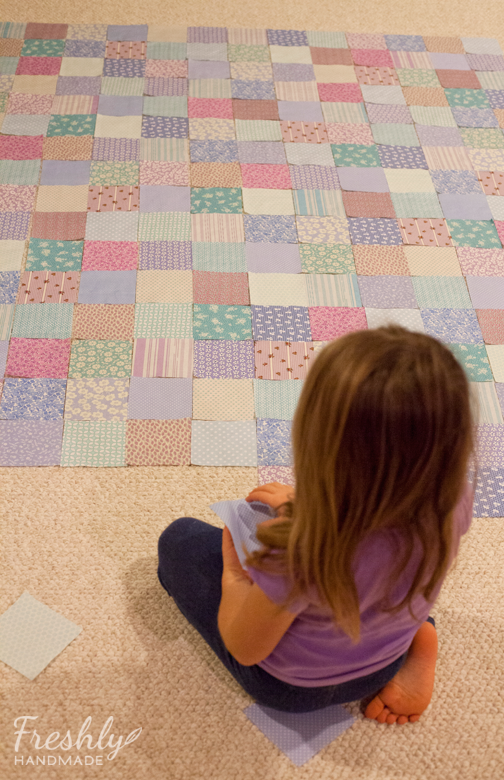 She wanted a quilt in her colors but I just had to add some shades of my liking for sanity purposes. 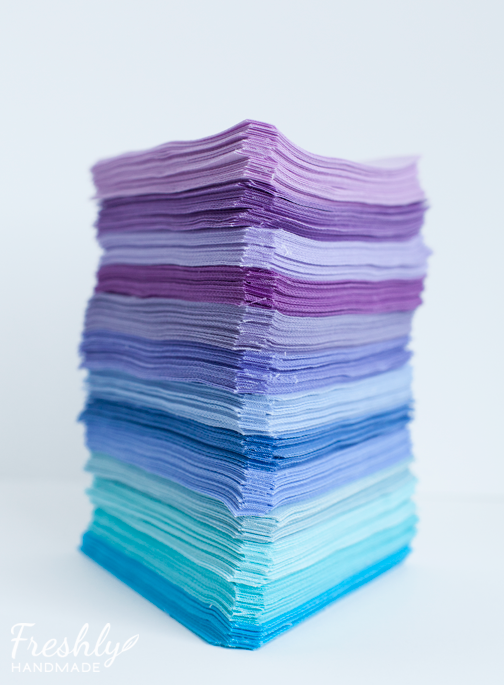 Together, we came up with 13 different Kona cotton colors in a variety of purples and blues. I guess that is the color palette around here lately. 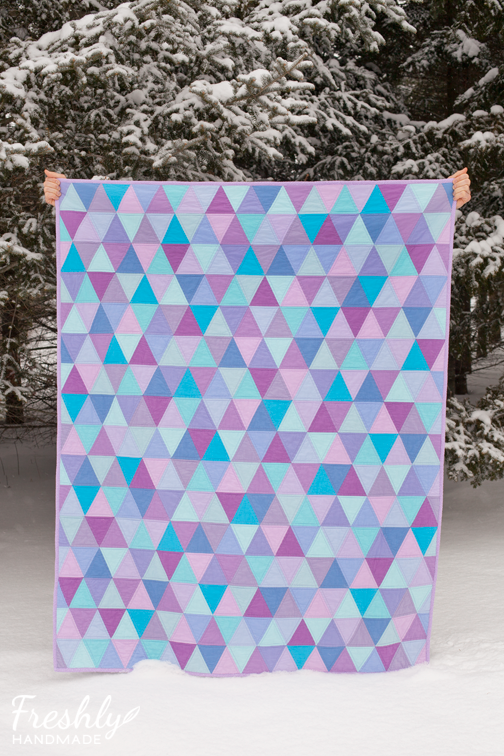 I've always wanted to make a triangle quilt and figured this would be the perfect opportunity. I bought myself a triangle acrylic ruler and went to town cutting. 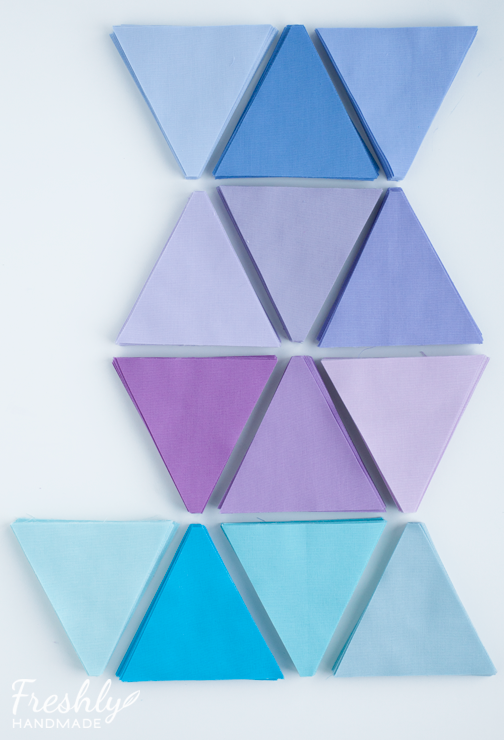 My big stack of triangles is waiting to be arranged. I'll be sharing more soon. 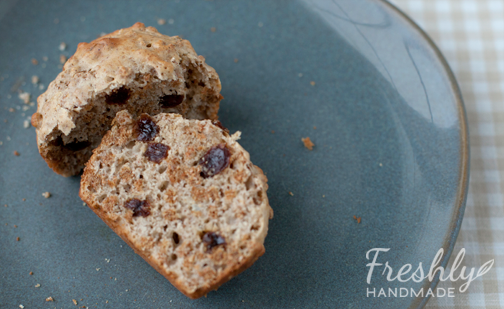 Again, If you want to get more picture updates in between posts, make sure to follow me on Instagram @freshlyhandmade. 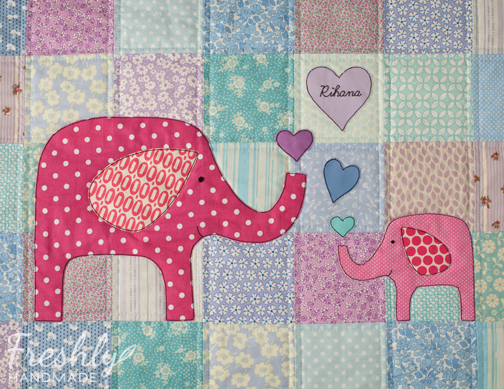 The elephant patchwork quilt is finished and she sure is sweet. 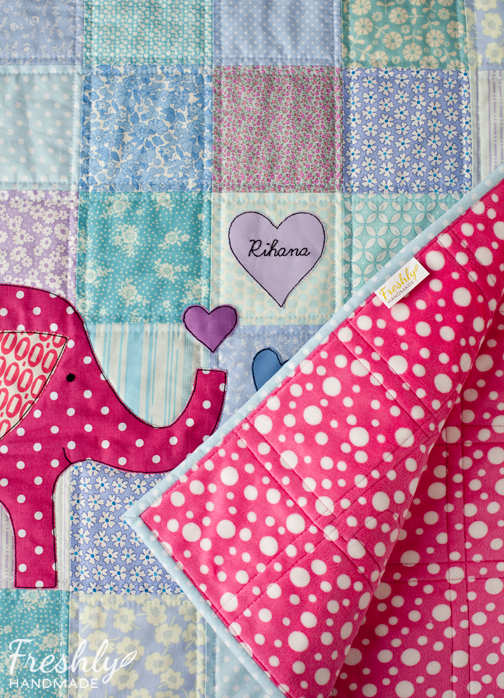 This quilt was made for a young girl named Rihana who really likes elephants. You can read my previous posts on this quilt here and here. And, if you follow me on Instagram @freshlyhandmade, you've probably already gotten a sneak peak at the elephants. 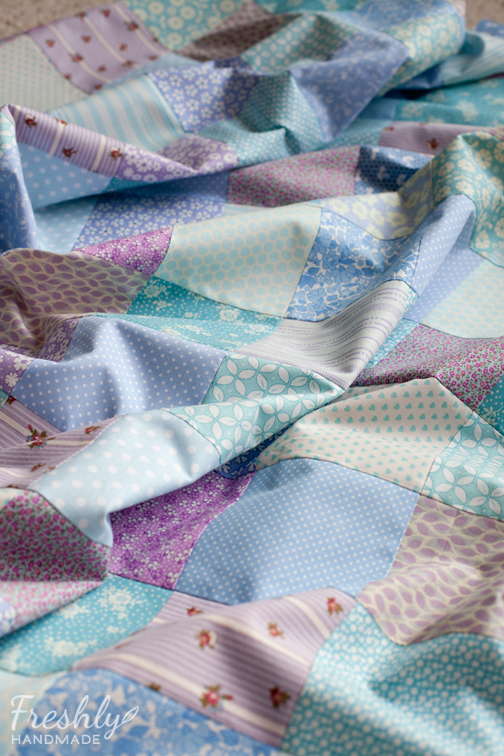 I started with a background patchwork made up of 4" squares in a variety of prints and shades of light blue, aqua and purple. I then appliqued the elephants and the hearts on top using a little Wonder Under and black thread to stitch the outlines. I hand stitched her name in the top heart to personalize it. 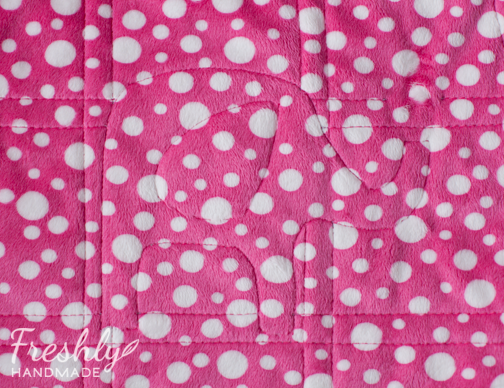 For the back, I used a super soft minky in pink and white polka dots to coordinate with the elephants on the front. It is SO soft! 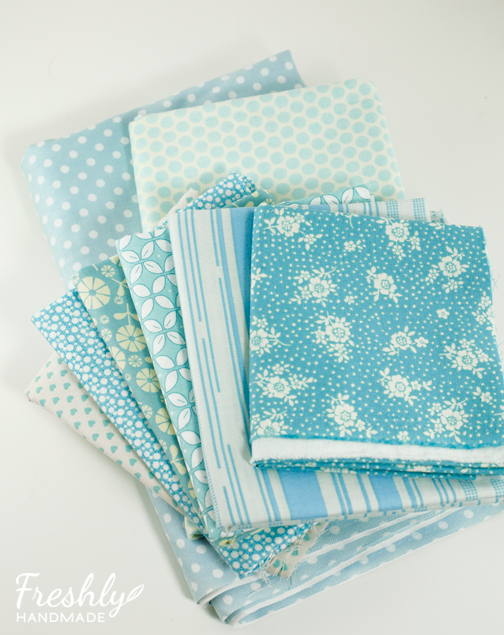 The binding is a light blue and white polka dot print that was also used in the top. 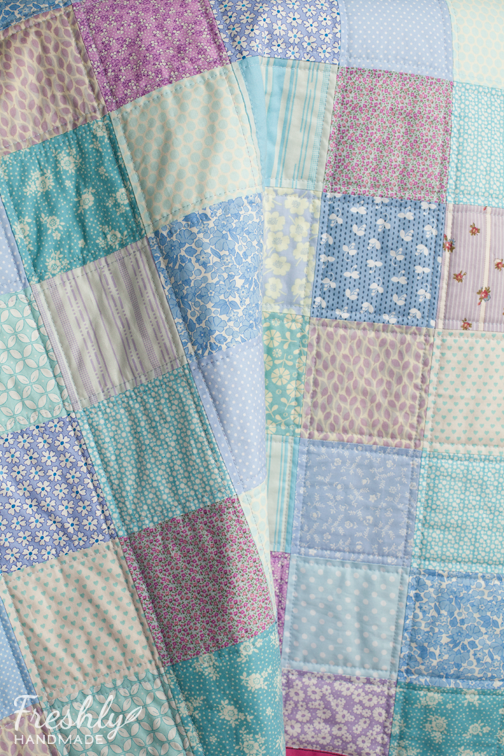 Using light blue thread on top and dark pink on the bottom, I quilted the patchwork squares with straight lines echoing the vertical and horizontal seams, stopping and starting around the elephants and hearts. I debated for quite some time whether or not to quilt on top of the elephants with a different stitch, but ultimately decided to let them be. To hold the layers together around the elephants, I stitched around each of the bodies and ears in coordinating colors so you really can't even tell from the front. You can see the stitch outline on the back here. The finished size of this quilt is 56" x 68". 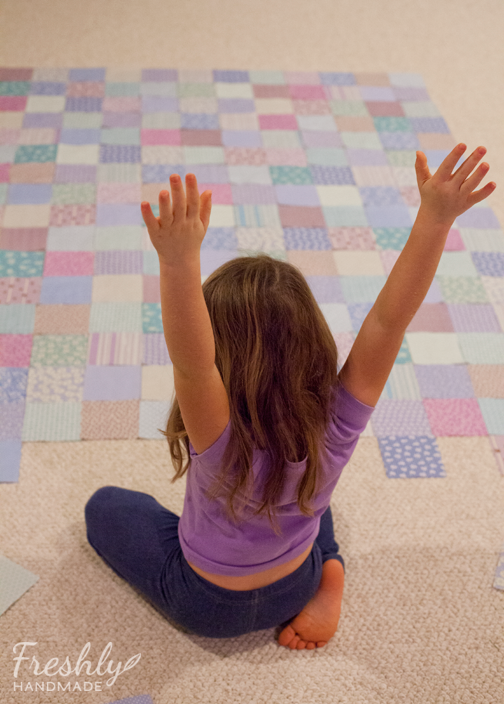 I am happy to report that Rihana was very pleased with her new quilt. She told her mom that she was never leaving it. How sweet! 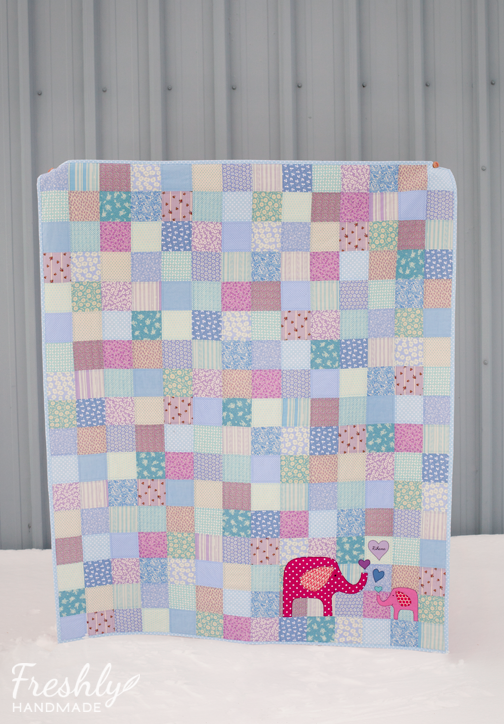 I've been plugging away at the elephant patchwork quilt I first posted about here. 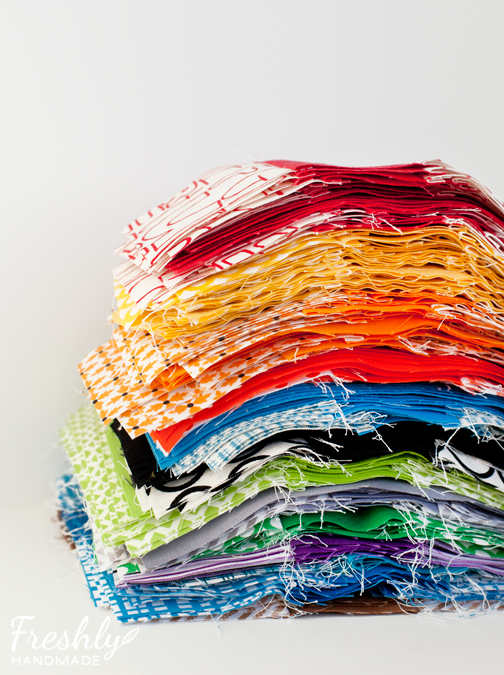 I started by cutting 4.5" squares from all the fabric. Then, I started arranging the blocks randomly on the floor to see how it would all come together. 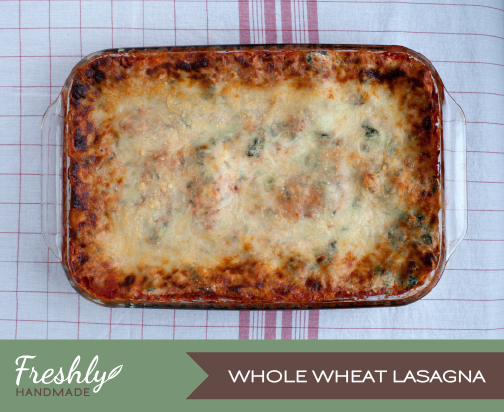 This step is one of my favorites, and it is clearly one of my daughter's as well. She always asks if she can help. A lot of the times, even though she's asked to help, she jumps in and starts telling me where the blocks need to go. I have to reign her in and tell her that this is mommy's fun time and she's stealing it. No, just kidding. I am hogging her play area floor so it was only fair to let her help. 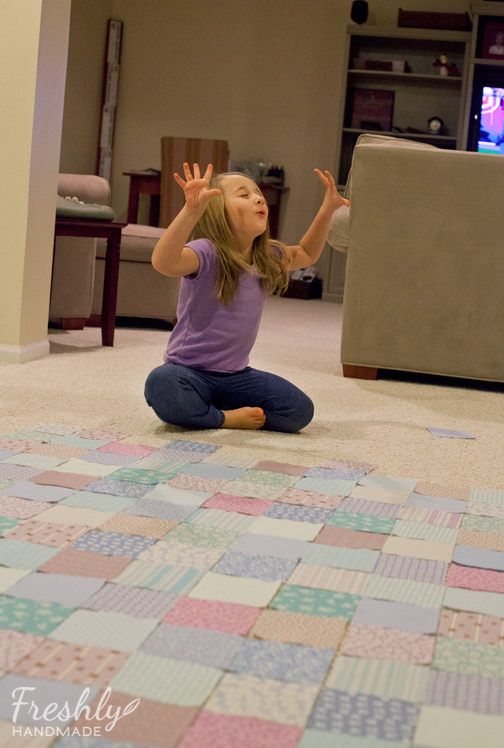 This time, I let her arrange the blocks toward the end all by herself and I would come and check each row as she went. It actually became a teaching moment. The best part of it all, the reason why I love this little spunky, hilarious five year old, was when she completed a row or liked what she had done, she threw her hands up in the air and exclaimed, "Perfection!". Oh, the things that come out of this child's mouth. The top is all sewn together and I love it just as it is. I want to keep it for myself honestly. The Christmas decorations are put away and I am ready to start on a new project. I've been asked to make a quilt for a young girl who likes elephants so I've been working with her mom to design something she'll like. I was pretty much given free reign to come up with the concept but she had a few criteria. She requested it include light blue and purple with dark pink elephants. Oh, and it should be girly. With a general concept in mind, I went to my stash and started pulling fabrics that I thought would work well for this quilt. 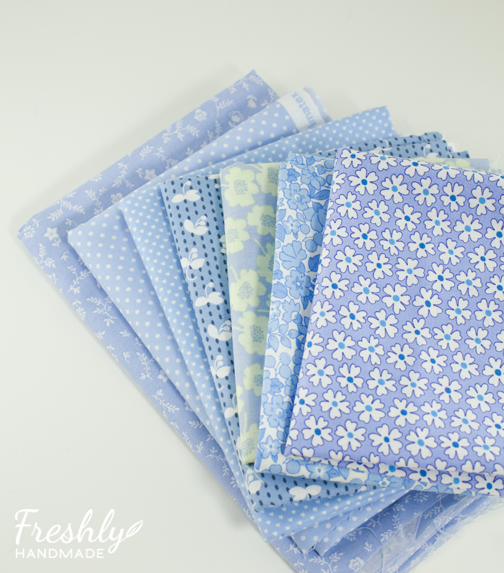 My idea was to make a simple square patchwork quilt using a variation of light blue, aqua, periwinkle and lavender fabrics for the top. 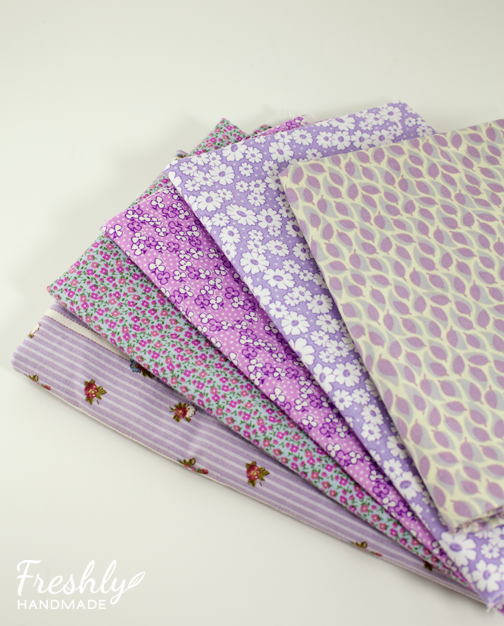 And I made sure to include some fun girly prints like florals and polka dots. I plan to applique a couple elephants in these pink fabrics down in one of the corners. I might still need to find a couple more dark pink prints to use. I'll see when I get further along. Here is a very loose idea of where I plan to go with it. 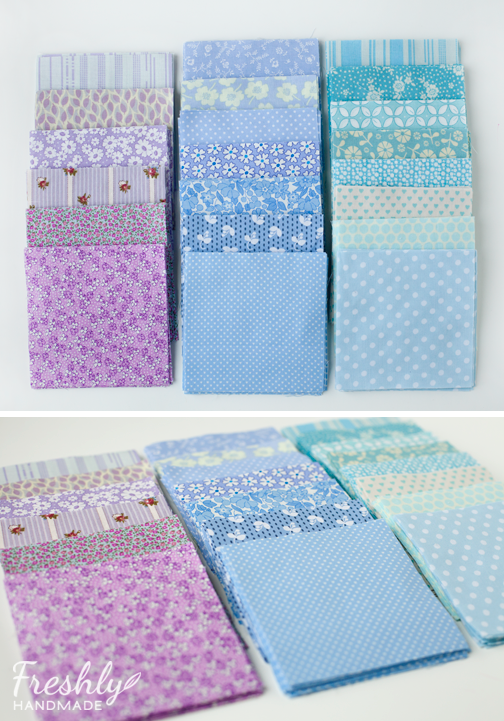 The blues and purples will be randomly pieced on the front. 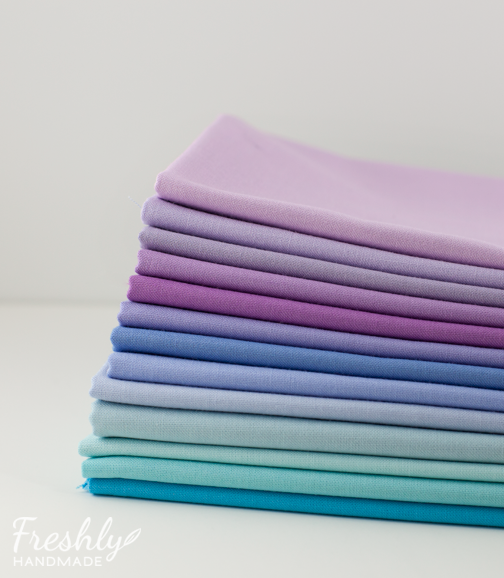 This is not my typical quilt, other than I would totally use these colors for a sweet girly quilt, but I don't generally put applique on my quilts. 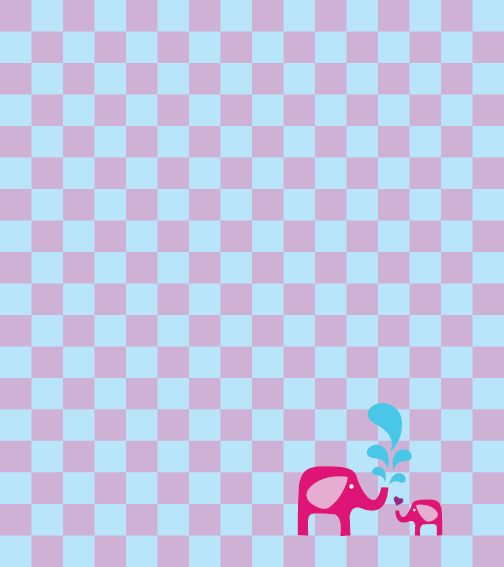 I wanted the elephants to be a subtle element and not overpower all the prints and colors behind it. I hope it ends up as pretty as it is in my head. Stay tuned.